Most eighteen year olds spend their summers in various states of debauchery, signing off from the world of A Levels and bidding farewell to under-age drinking. Remember those heady days? Waking up the morning after your exam results? No, me neither. Summers spent watching Jeremy Kyle and Loose Women, thinking of a brighter future ahead. Three years at university or an actual job loom large on the horizon, as does a life out from under the roof of your parents. When most of us were planning for the future, Seth Burkett was packing his bags for Brazil. Burkett was a left-back for Northern Premier outfit Stamford AFC and captain of their youth team. Turned down by Peterborough before rejecting an offer from Kettering Town, a chance meeting with a Brazilian agent – the same man who brought Denilson to Arsenal – took him to Salvador da Bahia in the east of Brazil for a football competition. While there, Burkett was spotted by Sorriso EC, a club from the state league of Mato Grosso, and invited to train with the club where he would earn himself a professional contract. Burkett went on to play just 15 minutes of competitive football for the club during his year-long stay..
Burkett tells his story well, his youthful enthusiasm oozes from the pages as he describes his time in Brazil. He is honest about his naivety when he first arrived, the issues he faced with the language barrier and his difficulty in acclimatising to a new culture. It’s Burkett’s off-the-field stories which bring to life his experiences, though life in a dorm in Brazil sounds oddly similar to the halls of residence at Preston. From hiding his £100 under his mattress to washing with soap used by his team-mates to clean their soiled underwear; Burkett’s time was never dull. As Burkett’s contract is cancelled and his visa expires, he returns home where he learns about his family’s history with football in Brazil. His great-great Uncle was Charlie Williams, Arsenal’s first-ever professional goalkeeper who went on to manage Fluminese. The Boy in Brazil is an entertaining story, and one which deserved to be told to a wider audience, but perhaps a piece in When Saturday Comes or The Blizzard would have been a better place to tell it. Despite being just 230 pages long, The Boy in Brazil struggles to captivate for the duration – it’s a great story padded out; caught somewhere between a coming-of-age tale, a history of Brazil and a football diary. 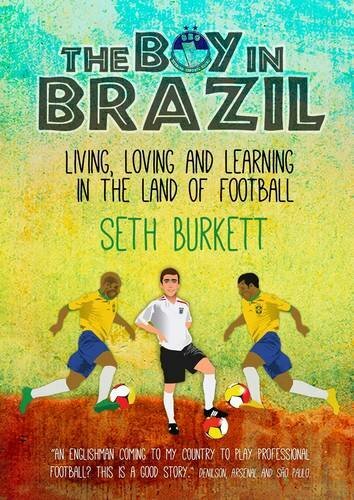 Released prior to the 2014 World Cup, Burkett’s book is a great introduction to the importance of football to Brazilian culture, told by the only Englishman to professional football in Brazil. It’s just a shame there wasn’t more of his story to tell.